The Aircraft Operations Area (AOA) is the portion of the airport which is specially designed for aircraft which taxis from their hangars or tie down location to the runways via ramps, taxiways, and/or taxi lanes. Because aircraft are designed for their flight characteristics and not for their ground handling performance, many aircraft do not have good visibility while on the ground. As a person with unescorted AOA access, it is your responsibility to stay clear of aircraft and maintain a safety first approach in everything you do. Everyone who desires unescorted access within the Aircraft Operations Area (AOA), must meet unescorted AOA access requirements including airport driver’s training and knowledge tests at least once annually. Persons who will only require access to the Non-Movement Area (ramps, hangars, tie downs, etc.) are only required to take the “NON-MOVEMENT AREA” Test. 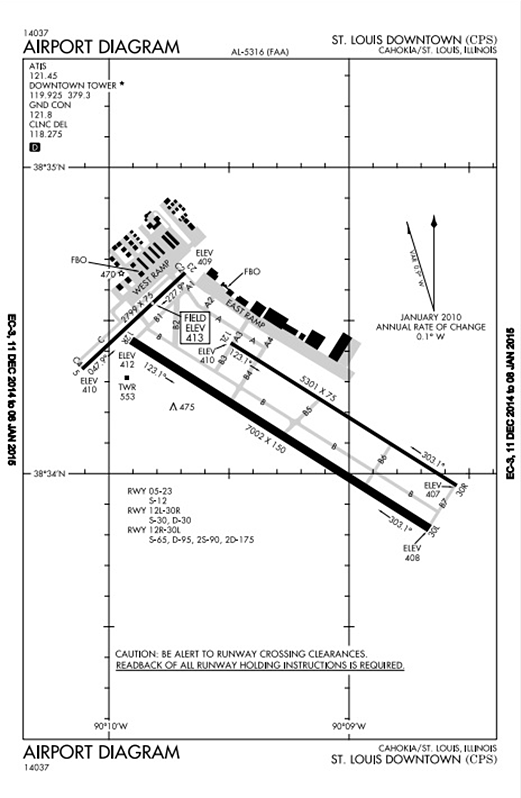 Persons who will require access to the Movement Area (runways, taxiways, other designated locations) must take the “NON-MOVEMENT AREA” test and the “MOVEMENT AREA” test. No person is granted unescorted AOA access without first completing the Request Unescorted AOA Access Form. Once the form has been completed, you will be directed on how to proceed. You may NOT drive on the AOA until you have received confirmation that your request for access has been granted and you have passed the applicable test(s). The following information is presented as additional required information in addition to the official Federal Aviaion Administration Ground Vehicle Operations Manual (PDF) **. All drivers should be familiar with the official FAA guide, and should have passed the self-assessment included in that document before requesting unescorted AOA access. Persons may also find the official Sample Ground Vehicle Operations Manual from which all of the following information is based upon. Vehicle and Aircraft Repair: In order to protect the general use areas of the airport, and prevent encroachment upon the rights of users, no owner or other person shall clean or make repairs to vehicles or aircraft anywhere other than in areas designated for that purpose. Tampering: Except as otherwise provided, no person, other than the owner, shall move, interfere or tamper with any motor vehicle or aircraft, or put into motion, take, or use any part there from, without the permission of the owner, or satisfactory evidence of the right to do so duly presented to Airport management. Ground Transportation: No vehicle or aircraft for hire shall load or unload materials or passengers at any place other than areas designated by Airport management. Violations: Violations of any of the above rules and regulations can result in the offenders gate card(s) being invalidated and ramp access privileges revoked.